Americans have long sought comfort in the kitchen. Even now. As if to prove it, one viewer wrote to "World News" about Nordic Ware, a company that specializes in kitchenware products, and its decision not to go to Mexico. So as part of our "Made in America: All-Stars" series, we traveled to Minneapolis, where the factory is seeing green far beyond the freshly painted green Bundt pans rapidly coming down the conveyor belt. At Nordic Ware, Jeff Brater ensures that the all-American Bundt pan -- the company's best-seller -- has the perfect coat of color. He said there were probably 15 to 20 different colors for a Bundt pan. "So the paint is actually on a timer, so it only shoots out when the Bundt pan's in front of it?" I asked. "I just kind of eyeball and make sure that it stops spraying right when the part gets done," he said. The husband and father of two is also a former minister who had been praying for a job. He's been at Nordic Ware for 15 months and counting. He said people were buying Nordic Ware's goods. "Yes, they certainly are!" And because of that, Brater had a job. In this tough economy, Americans are staying home and eating in more. Thanks to that, Nordic Ware's sales are up 30 percent from last year. The company has added to its staff for five years straight. In the past six months, Nordic Ware has hired 21 people. 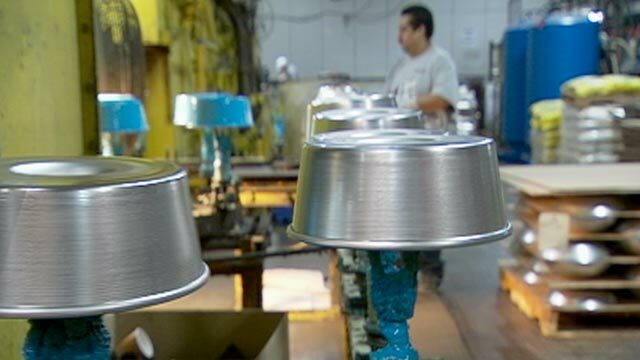 Nordic Ware has sold 65 million Bundt pans in its 65-year existence. It estimates that two out of three U.S. homes has one. I asked whether the one I remember in my mother's kitchen while growing up is from Nordic Ware. "Probably," I'm told with a smile. The Bundt pan has become a cultural marker of sorts. Remember "My Big Fat Greek Wedding," when the groom's parents met the bride's family? "What is this?" "A Bundt. A bunt? Bundt. Bunked? Bundt. BUNDT!" In 1946, it was a huge gamble. Grandma Dottie and Grandpa David Dalquist- - just back from the war -- started the company with $500. They didn't make a profit for the first 10 years. Dottie -- affectionately called Grandma Bundt at the factory -- was baker in chief and recipe-writer. "We all worked," she said. At 85 years old, she is still testing the new pans. In a 3-D computer lab, the company was busy molding the next Bundt pan as I cooked my first Bundt cake. "This is one of the family secrets: If you really want to get good definition to your Bundt cake, hit it on the floor," brand manager Jenny Dalquist told me. "The floor?" I asked. Fifty minutes later and with a sprinkle of powdered sugar, my first Bundt cake was ready for tasting. "Diane [Sawyer], this is for you." +'Made in America': U.S. Manufacturing Dying?